Hard copy, laser printed or multi-part automotive work order forms are unlikely to ever be completely replaced by "paperless" dealer management software systems. Estampe Car Dealer Supplies has a full and complete line of both stock and custom automotive work order forms for dealerships guaranteed to work with all car dealer software and automotive repair software. Estampe Car Dealer Supplies even still sells old fashion handwritten repair order forms for smaller repair and auto body shops that don't require the added expense or complications of an automotive repair software system to operate their business profitably. 1) Printed work order forms give your technicians a place to write notes about the inspection, diagnostic results and future repairs recommended. This can result in more detailed information about the customer's repair order then is typically captured by automotive repair software or dealer management software. Technician notes written on hard copy work order forms can then be filed away with the customer's records; giving you another source of information about the customer's repair order then just what's available on the invoice or stored in the car dealer software. 2) Hard copy work order forms give your service department technicians a place to record and punch times on. 3) Hard copy work order forms show detailed information about each vehicle repair order at a glance, and can be carried by hand for use in different departments of your dealership. Automotive work order forms include such information as: VIN, license plate number, body style, interior and exterior colors, production date, warranty information, engine serial number, radio code, key code and much more. 4) Custom printed work order forms give you an opportunity to communicate your business identity to the customer. 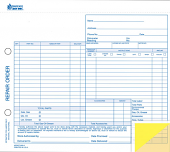 Custom printed work order forms include you logo and brands and help to promote your image. You can also emphasis important legal wording such as lien agreements, warranty information, environmental regulations etc. by custom printing these area's in bold or red for example. Estampe Car Dealer Supplies stocks work order forms for Reynolds & Reynolds, ADP and AutoSoft and custom prints work order forms for all dealership management software (DMS) such as: Reynolds & Reynolds (ERA® system), ADP, UCS, Arkona, Quorum, ADAM Systems, Auto/Mate, AutoSoft DMS and other leading car dealership software and automotive repair software. This 3-part Auto Service Repair Form is great for any service department and repair shop. The form is carbonless - White, Canary, Pink and Buff Tag and prints in Black Ink. Personalize this form by Crash Imprinting it in red ink on quantities of 500 and up. This 4-part Auto Service Repair Form is ideal for any service department and repair shop. The form is carbonless - White, Canary, Pink and Buff Tag and prints in Black Ink. Personalize this form by Crash Imprinting it in red ink on quantities of 500 and up.